Unless your job requires you to wear a uniform, choosing professional attire can be difficult. Of course, there are industry standards, such as the navy blue suit for accountants and attorneys. However, if you are in an industry for which there aren't straightforward rules like there are in fields like those, you may be wondering how to dress for work and job interviews. If you work in an industry that allows casual attire, you probably have even more questions. For example, how do you keep from crossing the line from informal to sloppy? How should you dress for job interviews? 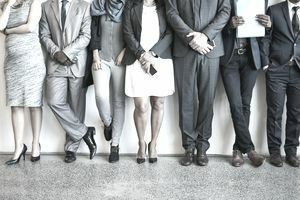 Should you try to "fit in" with your (hopefully) future colleagues or should you lean toward looking your professional best? No matter what the dress code is in your organization—business suits or jeans and t-shirts—your clothes should always be neat and clean. Keep your shoes in good condition. Polish them and take them to a shoemaker for repairs if necessary. Don't wear heels that are too high and make it difficult for you to get around. Your hair should be neatly styled. Bring a comb and duck into a restroom for a quick touchup if necessary before you begin your workday. Keep makeup, if you choose to wear it, subtle. Nails should be clean and neat. Make sure they aren't overly long. Dress for the job you want. If you aspire to be a manager, dress like the managers in your company. Dressing casually doesn't mean you have a license to be sloppy. Don't wear your old, faded jeans and t-shirts to work. Do not, under any circumstances, wear t-shirts with inappropriate things printed on them or that say anything that might make others uncomfortable. For instance, don't wear your politics on your sleeve, literally, for the same reasons you should avoid discussing politics at work. Save your beachwear for days you are off from work. Short-shorts and tank tops are off limits. Flip flops are also a no-no. You can't go wrong with khakis and a sports shirt, sweater, or blouse. If you are going to a meeting or making a presentation, professional attire may be for the occasion. Adhere to the prospective employer's dress code, if there is one, or learn about the typical attire. Talk to people in your network who work at the company or know someone who does. Another trick is to hang out in the parking lot or near the building entrance before the workday begins to observe employees arriving for work. If you can't manage to get there before work, you can try to watch people when they leave at the end of the day but don't be fooled. People often change their clothes to get ready for their after-work activities. You should always dress slightly better for a job interview than you would if you were an employee. For example, if the company dress code doesn't require suits, you may want to wear one anyway. If very casual clothing is allowed, for example, jeans and t-shirts, you should take it up a notch and instead, put on a nice pair of pants and a button-down shirt. After all, this is a special occasion, and you always want to look your best. Cover up tattoos and remove body jewelry until you know whether they are acceptable at that particular workplace. If you dye your hair unusual colors, you may want to go back to your natural hair color for a little while too. For many people, the ability to express their individuality through their attire, tattoos, piercings and hair color is extremely important. If that describes you, take it into consideration when deciding whether a particular work environment is right for you.